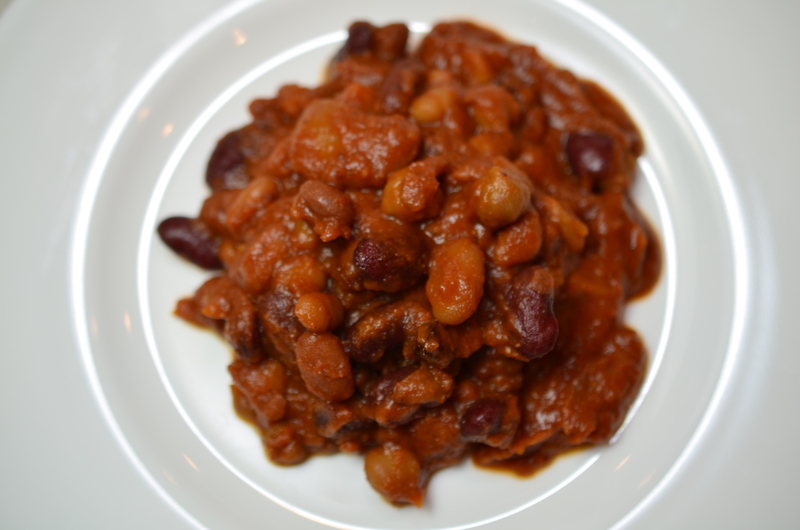 An interesting mix of beans gives texture and color while they swim in a homemade sauce that is sweet, tangy with just the right amount of spice. If you like a lot of sauce with your beans, double all of the sauce ingredients. Saute the bacon in a large skillet set over medium high heat. Once the bacon has crisped and rendered off it's fat, remove the bacon to a paper towel lined plate. Pour off all but 2 TB of grease. Add onion and green pepper and saute until soft, about 5 minutes. Stir in tomato paste, ketchup, mustard, sugar, vinegar, salt, and horseradish. Once mixture is smooth, stir in dry mustard, and paprika. Drain and rinse all of the beans. Dump them into the crock of a large slow cooker. Pour sauce over top. Give a good stir to incorporate sauce. Pour 2 cups water over top. Cover. Cook on High setting for 6 hours. At about the 4 hour mark, check to see if the beans are moist enough. If they look dry or the sauce appears too thick, add another cup to 2 cups of water. After 6 hours, remove lid and cook for 1 hour to reduce any excess liquid from beans. The bean's sauce will become thick and rich. If the sauce looks broken or thin, it hasn't cooked long enough. Store leftovers in a covered container for up to a week in the refrigerator.